Here at Tennessee Arms, we pride ourselves on being able to offer you as many options as we can when it comes to purchasing your lower receiver. Be it black, clear, colors that match industry standard furniture, or tinted clear lowers. But, where we have set ourselves apart from the rest of the pack is our engraving service. We have many "On File" engravings to choose from that can make your lower uniquely yours. We offer Patriotic, Greek, and Nordic designs that we can put on any of our Nylon Lowers. If we don't have what you want On File, you can always upload your own artwork on the "Custom Engraved Lowers" section of this page. The process involves us converting your artwork into a black and white or greyscale version of your artwork and then sending it to the laser to be engraved. It does require a little time, but turnaround on orders is fairly quick compared to industry standards. All engravings are then engraved using a 40 Watt CO2 laser with a 1000 Dot Per Inch resolution for a very high quality engraving for a very low price. 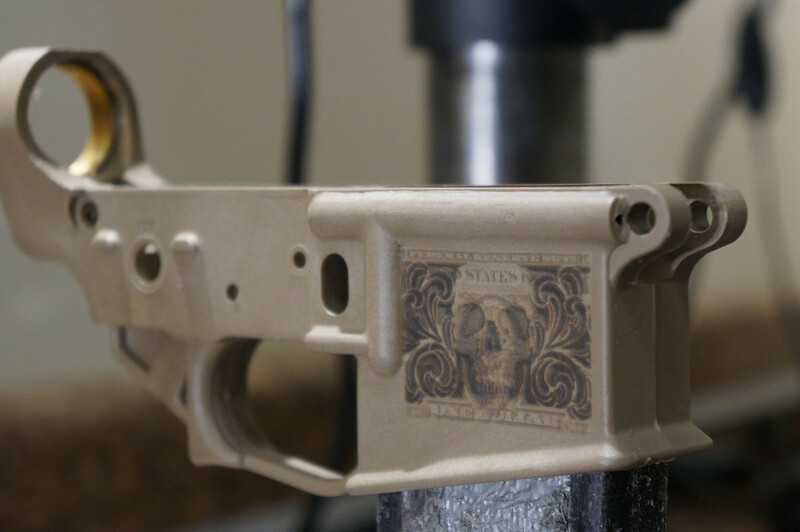 We can also engrave lowers with SBR Trust information if need be and can be engraved to the ATF standard of .003 inches. If you have any questions about our engraving service, please feel free to contact John at john@tac-llc.com .